Twitter’s meteoric rise to fame has been hard to miss, especially after it really took off in 2009. The latest number being thrown around is that the service will soon have 18 million users in the United States alone. 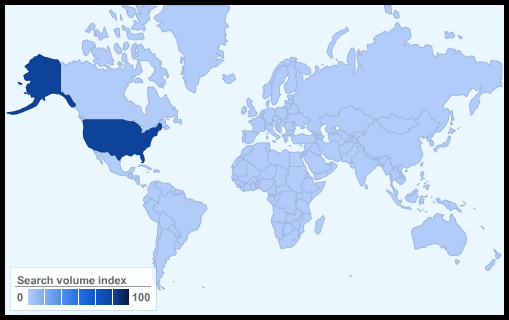 We all know that Twitter is extremely popular in the United States, but it’s pretty darn popular in the rest of the world as well (Pingdom is on Twitter, and we’re Swedes!) But it took Twitter a while to get there. Let’s take a tour of the geographic expansion of Twitter from its launch in 2006 until today in 2009. 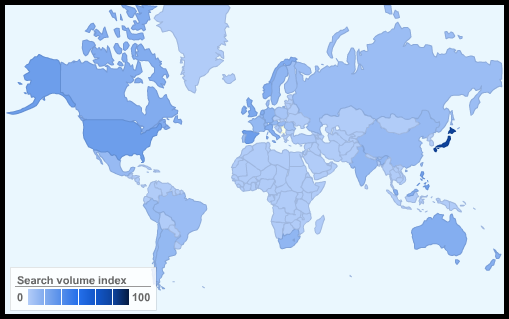 The maps below are based on Google search data. We have found over and over again that a high search interest translates well into actual popularity of an online service, in this case searches for “Twitter”. In its first year Twitter was pretty much a US-only phenomenon, made blatantly clear by this map showing the regional interest for Twitter back then. More Google search insights for Twitter in 2006 available here. In 2007 the word about Twitter started to spread outside the US borders. Especially noteworthy is the strong surge of interest in Japan, where the service became very popular. More Google search insights for Twitter in 2007 available here. In 2008 the situation was starting to look a bit more like it does today. The interest in Twitter continued to surge, triggered in part by high-profile Twitter users (Obama famously used Twitter during his presidential campaign, to name an example). Interest for Twitter continued to be strong in Japan and countries like the UK, Australia and Canada were also jumping on the bandwagon. More Google search insights for Twitter in 2008 available here. As is widely known, 2009 is the year that Twitter really took off like a rocket. It has received huge amounts of attention in the US where it continues to show up basically everywhere (even showcased by Oprah), and Twitter experienced a phenomenal boost in the UK where the service has been embraced with open arms and helped by celebrities like Stephen Fry and John Cleese (we wrote about this back in March). 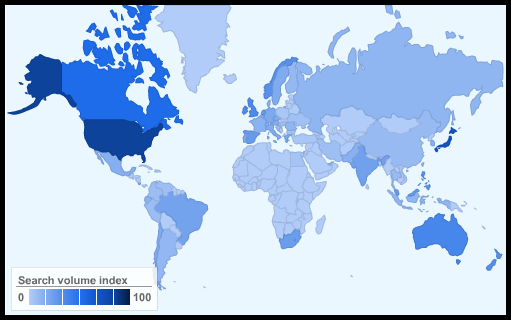 Canada, Brazil, Ireland, Australia, South Africa and New Zealand are other countries where the interest for Twitter is very strong. More Google search insights for Twitter in 2009 available here. Now that we’ve gone through the years of Twitter’s existence, let’s look at another representation of the relative popularity of Twitter in its first year versus today. It’s the same data as above, but shown here in diagram form. It’s pretty safe to say that Twitter IS indeed conquering the world. An interesting thing here is that all of the top countries, with the notable exception of Brazil, are English-speaking countries. This should probably not come as a surprise since to get the most out of Twitter and its existing user base, English is a must. On the other hand, it’s probably just a matter of time before other languages take off on Twitter. Does anyone dare to make a prediction of what will happen to Twitter in 2010? A note on the data: These numbers from Google are normalized, i.e. they show the regional interest relative to the number of internet users in each country (or searches made in each country, we’re not sure what method Google uses). In other words, they don’t necessarily correspond to where Twitter has the most users, but where it is garnering the most interest. That’s how smaller countries like New Zealand can rank relatively high on the list, because a large part of their population (regardless of population size) search for information about Twitter. The case of Japan and twitter is interesting. As you point out, the charts showing twitter penetration are dominated by English speaking countries. Then, in 2007 Japan jumps to the very top of the twitter usage chart. However, by 2009 it is not even in the top 10. What happened in Japan? Can one assume that they Japanese got over twitter? Or did they find a micro blog site they liked better? I suspect the later is the case. Here is some info on twitter rivals in Japan. wow the chart at bottom says it all from only U.S to dominating that much internationally, go twitter !! Can’t wait to see what 2010 will bring us?